The Core Competencies Model was introduced by two business management theorists called Hamel and Prahalad. They introduced the model in a 1990 paper called, The Core Competence of the Corporation. The Core Competencies Model is a strategic tool. Many people believe that strategy is about competing to be the best. It isn’t. It’s about competing to be unique. It is in shaping your uniqueness where the core competencies model can be of service. “Unique” means that competitors aren’t doing it. “Important” means that it is fundamental to helping the company generate sales. “Strategically well” means that it’s difficult for competitors to copy. Many strategic models, such as Porter’s Five Forces and SWOT Analysis use an outside-in approach. They examine customers and the marketplace then use this analysis to drive and shape the organization and its products. The Core Competency Model turns this on its head, using an inside-out approach. In the model, a long-term competitive advantage is achieved by having the ability to build a core competency at a lower-cost and faster than competitors. Thus, real competitive advantage comes from managements ability to bring together technology, skills, and processes and turn them into a core competency. This core competency results in unique and competitive products in the marketplace. Because the products come from a core competency these products can sometimes be unusual or surprising. In a nutshell, core competencies are about working hard to build uniqueness and then leveraging this uniqueness to be successful in the marketplace. “Me too” businesses with nothing unique to offer the customer can only really compete on price. To bring the theory to life let’s look at some examples of real companies and their core competencies. IKEA’s core competency is its unique design capabilities. This capability results in offering customers great value for money. It is very hard for competitors to compete with great design at a very low cost. Apple’s core competencies are its user-centered design along with its integrated software and hardware ecosystem. The design is so strong that it is practically impossible for competitors to create laptops that can sell for a similarly high price. BMW’s core competency is that everything it does is underpinned by its active driving design philosophy. This has resulted in a long history of unique, high-performance cars. Even if a competitor can match speed performance, speed alone does not create the “ultimate driving experience”. This makes it extremely hard for competitors to compete. You can probably think of lots of things your company could do well. But would each of them be a core competency? Hamel and Prahalad provide three tests to determine whether something is a true core competency. If you can answer yes to all of these questions then you might just have identified a core competency. 1. Does it provide consumer benefits? A core competency must result in something in the marketplace that could strongly influence the customer to purchase your product. If it doesn’t, then it has no impact on your competitive position and isn’t a core competency. 2. Is it difficult to imitate? A core competency should be difficult for competitors to imitate. This allows your products to remain unique in the marketplace. Investing in the continuous improvement of your core competency is important. 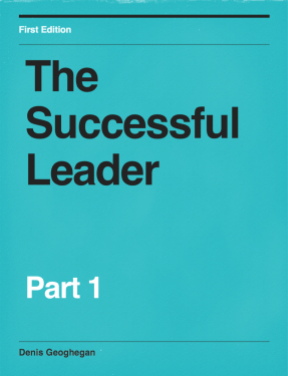 By doing so you can sustain your competitive advantage into the future. 3. Can it be leveraged widely? A core competency should be applicable to many products and markets. Let’s use these tests to see if IKEA’s unique design capability is a core competency. Yes. Consumers get great design at very cheap prices. Yes. It’s very difficult to produce products with great design at very low prices. Even if a competitor could match IKEA’s design it wouldn’t be able to match it on price. This is due to the economies of scale of IKEA’s global distribution network. Yes. Ikea’s design expertise could be used to produce all kinds of products, from chairs to light fittings. Brainstorm a list of things that are important to your customers. Include things that are important now as well as things that you think be relevant in the future. Investigate each item you’ve listed trying to identify the competencies that underpin them. Brainstorm a list of your existing competencies. A “Strengths” part of a SWOT analysis can be useful in helping to identify your competencies. Does it provide consumer benefits? Is it difficult to imitate? Can it be leveraged widely? If you have identified core competencies you already have. Think about how these competencies can be developed further and improved. If you have no core competencies but have identified potential core competencies. Think about which core competency it makes sense for you to develop. It will typically be the one with the greatest potential to impact your customer’s buying decision. Note that developing a core competency is not free. For example, having the best customer support doesn’t just happen. Instead, it is the result of a conscious decision to invest in that area. If you identified no core competencies whatsoever. Involving more people in the brainstorming session. Using an outside facilitator to guide the brainstorming session. 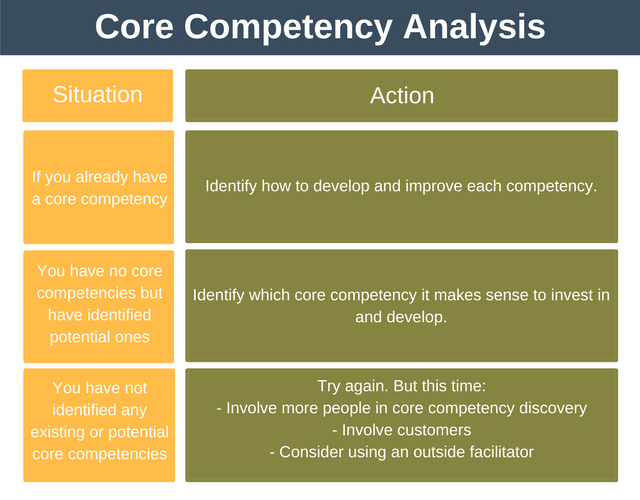 The following core competencies analysis diagram summaries the approach to take. From a strategic point of view, Hamel and Prahalad recommended that organizations focus on core competencies. They also recommend that they then outsource all non-core activities. This explains why IKEA’s design center is based at its HQ in Sweden. It also explains why manufacturing is outsourced as it isn’t a core competency. Likewise for Apple. Its core competency in design is based in Cupertino, California. The manufacture of these machines designed in California is outsourced to China. That Hamal and Prahalad recommended outsourcing all noncore activities has resulted in some criticism of the core competencies model. Focusing on core competencies can constrain an organizations ability to adapt. The human element is ignored to the detriment of the organization. If an accountant is outsourced how to they feel inclined to do the best job they can for a company when someone else is paying their salary? Outsourcing almost every noncore activity can be over-zealous. Over-zealous outsourcing can lead to a loss of competitiveness as skills that the business had and now lost. The Core Competencies Model is an inside-out strategic tool. It advocates focusing on those core activities that give an organization a sustainable strategic advantage. It then advocates outsourcing everything else.